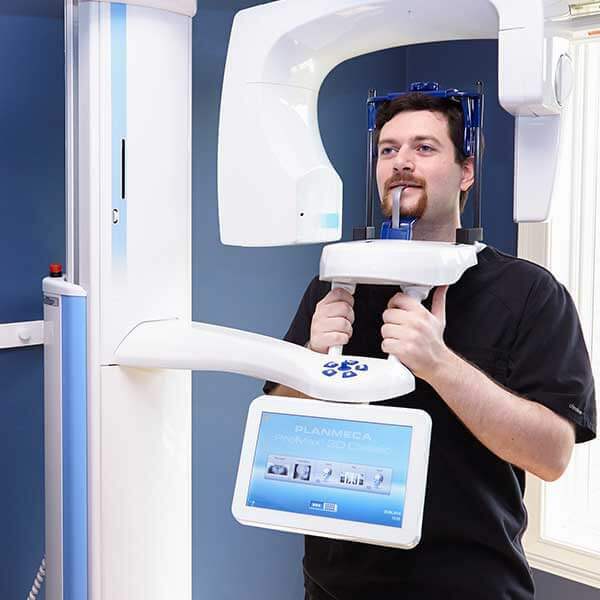 Arrowhead Dental has always been on the forefront of acquiring and becoming proficient with the latest dental technology. Our entire team is continually training to keep abreast of changes in dental procedures and technology that make your treatment and time spent in our office the best it possible can be. 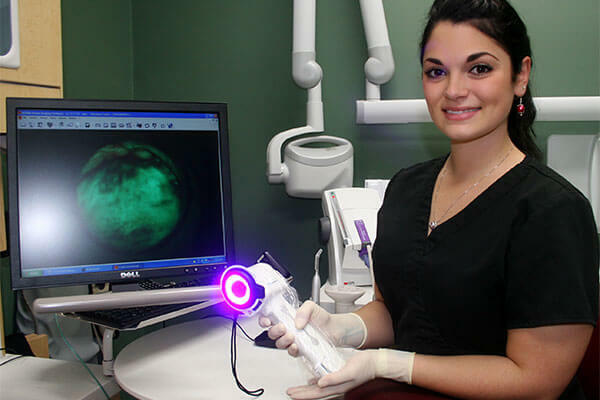 Our diagnodent wand uses a focused beam of laser light to detect decay that has penetrated through the hard outer enamel surface of your tooth. The diagnodent laser allows early detection of decay before an x-ray will “see it.” Decay caught in the very early stages using the laser can be stopped with sealants, fluoride and improved home care. Oral cancer is a very treatable disease when caught in its early stages. The most important prevention method is having a through clinical exam by your dentist or hygienist at least once a year. We now have a very exciting new tool to detect abnormal tissue before we can actually even see it in a normal visual exam. It’s called the Velscope, and it uses natural tissue fluorescence to help detect intraoral abnormalities very early. A special wavelength LED light is used and we are quickly able to detect abnormal cells by their dark appearance while normal surrounding tissue is a light green. 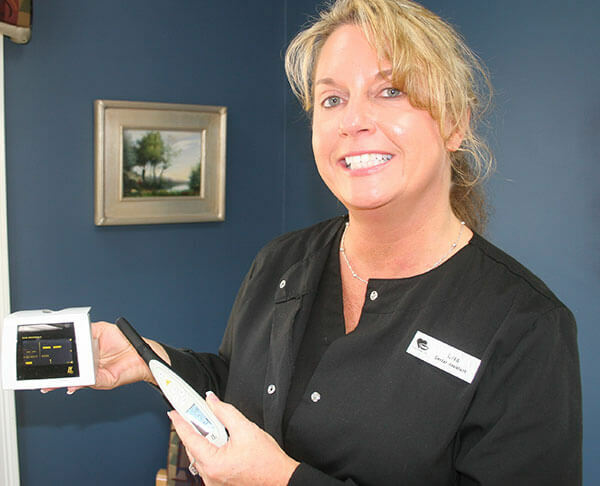 Our doctors and hygienists may be using this instrument in your next oral cancer screening. This is Dr. Brendan Gouin with our PerioLase MVP-7, currently the only FDA approved laser for periodontal surgery. The perio laser is used to treat periodontal disease using the LANAP protocol, an alternative to conventional periodontal surgery. This laser can also be used for many other soft tissue conditions with great results and little to no discomfort. This is our Plan Meca 3D cone beam scanner. It creates 3 dimensional images of your tooth and jaw showing us where important nerves and other anatomical structures are located. This allows us to plan in advance for guided implant placement, difficult oral surgery and helps greatly in the diagnosis of oral pathology. Our office converted all patient records to digital format well before it was federally mandated to do so. All data and x-rays are stored securely; encrypted and in a HIPPA compliant manner. EMR allows for efficient use, storage and transfer of important patient information to make sure your treatment can be administered in the best possible way. Great advances have been made toward replacing the noisy air driven hand pieces (drills) that we use with much quieter electric drills. For our patients who “can’t stand the sound of the drill” this is a much awaited improvement. Our office has acquired some electric hand pieces to try while the technology continues to improve. 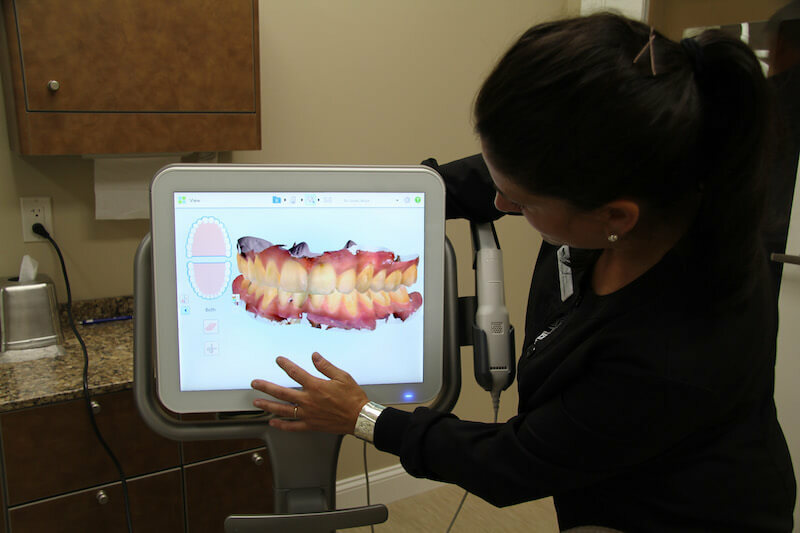 Our iTero digital scanner allows us to take digital impressions of your teeth eliminating conventional impressions for many of our procedures. 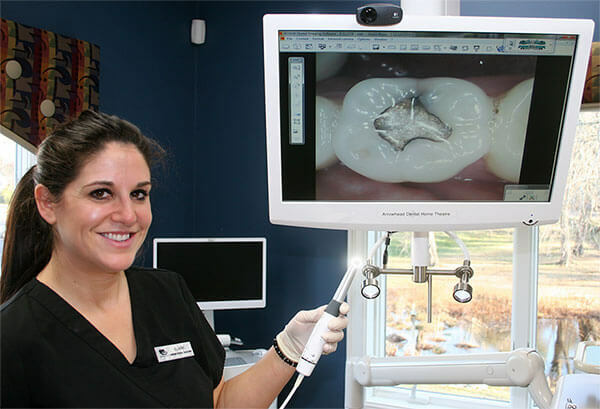 Laser light is scanned within your mouth teeth and an extremely accurate digital image is created of your teeth. This digital file is sent directly to our laboratory where expert dental technicians using computer assisted design (CAD) and computer assisted machining (CAM) to make crowns, bridges and onlays for your teeth. This technology is improving rapidly and will soon replace most conventional impressions. 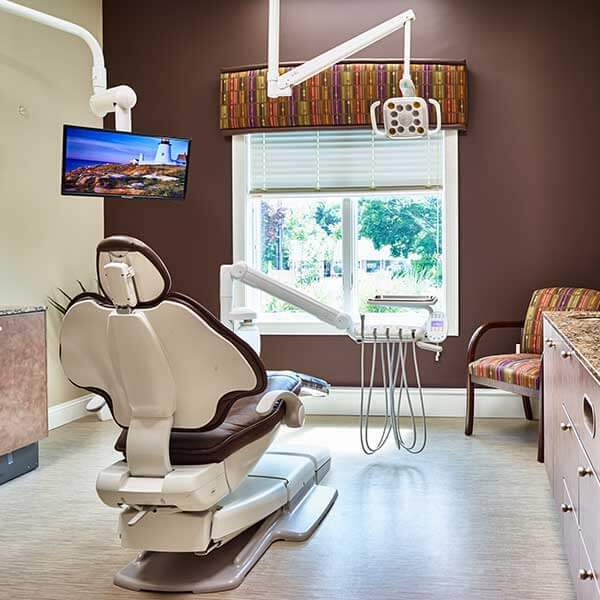 Positioned above every dental chair are digital monitors which allow our patients to participate in the co-diagnosis of their oral condition by viewing x-ray, photos and video of their dental exam. The monitors are also used for patient education videos; relaxing DVD’s or cable programming to take your mind away from dental treatment. We offer complimentary Wi-Fi in our reception areas and throughout the office. Just ask one of our Patient Care Coordinators for the password and a complimentary iPad for you to use while in our office. All x-rays taken our office are performed with digital sensors. This has allowed us to reduce what was already very low exposure levels by another 50% making digital x-rays very safe. As a comparison the average radiation exposure a person receives from natural sources per year is 3,000 microsieverts (msv), a mammogram is 440 msv, a CT scan is 8,000 msv, a five hour airline flight is 25 msv, while a single digital dental intraoral image is only 4 microsieverts, a panoramic film is 17 msv. Dental images are extremely low dose compared with medical imaging and cumulative natural sources.